Acne is a common skin condition that majority of teens and adults have to contend with. As a result, people have resorted to all sort of manufactured treatment options. Alternatively, young people wash their faces numerous times throughout the day to try and get rid of excess oil and dirt with the hope that it will to some extent alleviate their acne. Trying to find the right solution to clear acne once and for all is like looking for a needle in a haystack. 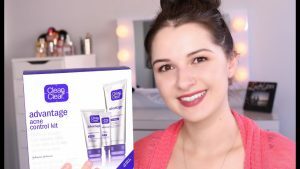 For this reason, here is a short discussion on issues pertaining to acne and how to use the Clean and Clear Acne Control Kit to treat acne once and for all. In the Clean and Clear Acne Control kit, you will find a larger tube containing the cleanser, a smaller tube containing your moisturizer and a much smaller tube with a fast action spot clearing treatment. The cleanser is infused with Benzoyl Peroxide which is meant to get deep under your skin to fight germs and clean your skin. The moisturizer, on the other hand, is developed using intricate formulas to dissolve excess oil hence keeping your skin soft and plump. Within as little as 8 hours after using the fast action spot clearing treatment you are able to see your pimples slowly fade away and later disappear. Owing to various poor habits, one may wonder why the treatment is not working as desired. But in order for the Clean and Clear Acne Control kit to work properly, you have to be keen about your surroundings and adopt habits that are friendlier to your skin. What are some habits that you need to stop? Washing your face too often– washing your face once in a day is usually enough for a person who leads a normal life with average activity. At most, it is advisable to wash your face a maximum of two times in a day. Washing your face too often may lead to acne breakouts as you strip the skin of sebum. Sebum is a protective oil that aids to keep your skin moisturized. Using oil-based products– Talk of facial beauty creams, lotion, or makeup, adding oil-based products on acne prone skin contributes to clogging of pores. This is why your face ends up irritated or you develop more pimples each time you apply oil-based products. Sleeping with makeup on-It is a written rule of thumb that you should never sleep without carefully and properly removing all your makeup. Excessive sun exposure-The sun emits UV rays that are harmful to your skin. Be sure to always apply sunscreen to protect your skin whenever you suspect that you will be spending a long time outside. Using homemade DIY products to treat acne-In desperation, people have tried all kinds of homemade means to help get rid of stubborn pimples on their face. While some DIY treatments work for a few, the majority are left nursing even worse acne breakouts than they did before. This Clean and clear Acne Control kit is a rare acne treatment product that has 100% success rate on condition that you avoid the aforementioned poor habits. Consequently. This acne control kit has gained popularity and great respect among thousands upon thousands of people battling acne. It is a reliable, highly effective and suitable product ideal for use on all skin types. Within days of using this kit, you will see significant change in how bright your face looks and how soft your skin feels. 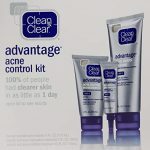 Note that the Clean and Clear Acne Control kit can also be used by people who do not have acne. If you simply want to maintain your skin in a healthy, moisturized, clean and pimple free condition, This kit is all you need to keep your skin smooth, fresh and most importantly clear. Acne is a completely manageable skin condition. If you want to be counted as one among those who trodden the route and emerged victorious in your fight against acne, take action today. 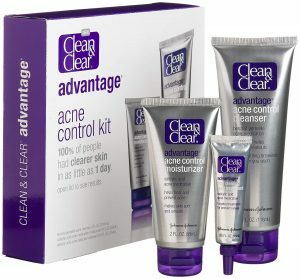 Use the Clean and Clear Acne Control kit as your everyday acne solution and you will never look back. 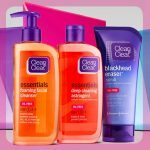 To learn more about acne and see other reliable clean and clear treatments that you should try, refer to the previous article on Best Clean and Clear Products for Acne.